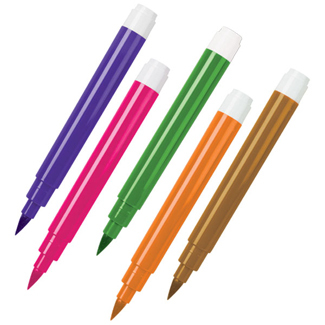 Brand: Wilton 609-131 Units: 1 set/ 5 pens total Use pens to draw edible messages and designs on molded candy or dipped treats. After use, wipe tip with a clean paper towel. Use pens to draw edible messages and designs on molded candy or dipped treats. After use, wipe tip with a clean paper towel. Ingredients: Pink- Purified Water, Propylene Glycol, FD&C Red #3. Brown- Purified Water, FD&C Red #40, Yellow #5, Citric Acid, FD&C Blue #1, Sodium Benzoate (Preservative). Purple- Purified Water, Propylene Glycol, FD&C Red#3, Blue #1. Orange-Yellow- Purified Water, FD&C Yellow #6, Citric Acid, Sodium Benzoate (Preservative). Green-Green- Purified Water, FD&C Yellow #5, Blue #1, Sodium Benzoate (Preservative), Citric Acid.